Last night’s festivities were truly a major shift from last year. 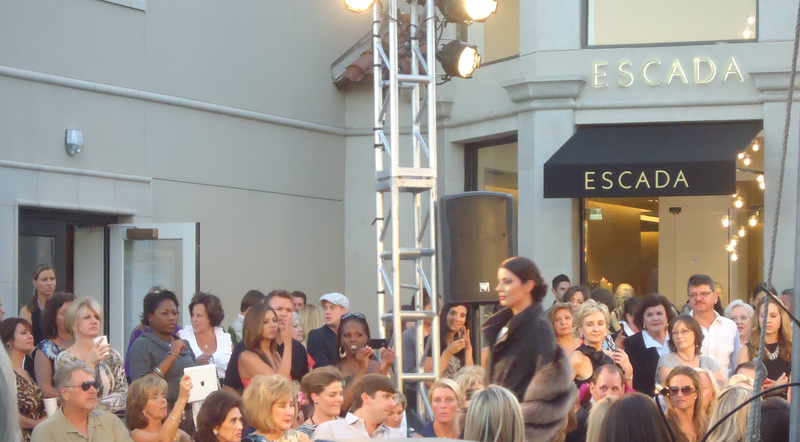 It was clear that people really did show up for Fashions Night Out. All over DFW fashion was really out and about taking in all that the night had to offer, the shows, the cocktails and all that in between. However what the night was truly about was to shop, and sadly fashion may have been out, but clearly it was out to sip and be seen, “only”, given the DOW fell 303 points today. The night brought out many of DFW’s most notable. I myself was found strolling around Highland Park Village,which I must say Highland Park Village played the most wonderful host, the Lux sidewalk talk was the perfect mix of chic and fab-ness the night was ment to be. So much to do, so little time could only describe the mood and feeling of the night. Jimmy Choo’s launch of D Magazine’s Style Sheet, was among the most notable events of the night, the wine service, and plethora of FNO merchandise available gave way to “real” Fashion’s Night Out. Shouts and toast of congratulations to Kristi and Scot Redman, for a Job well done on StyleSheet, set an atmosphere of cheer and grace, who couldn’t help but shop? The other most notable event of the evening was the two-part Fashion Show, produced by DFW’s Fashion Legend, Jan Strimple, featuring many of the surrounding designer boutiques. Walking through Highland Park Village and suddenly hearing the graceful voice of Jan Strimple in the air saying, “Show will begin in 10 minutes”, sent the feeling of overwhelming excitement through me, For a Jan Strimple Show should never be missed. I say this with much confidence, for a Show produced by our Icon personifies what Fashion is, a lifestyle. the appreciation and celebration of it was Cleary felt with the tremendous turn out of the outdoor runway. Fashion’s Night Out, does go without saying that it was a success this year,well at least in the festive part of it all. I couldn’t help but notice that, in all respect, the overwhelming amount of people who found themselves, well, out, it made for an interesting mix of people. In the back of my mind, it almost felt fashion had become a tad to celebratory in the sense that people weren’t shopping, such as, at Christian Louboutin that seemed to have become a standing room only location, people crammed inside with cocktails in hand, rather than the night’s featured pumps, was very sad to see this season’s Daffodil Crystal Plat Pump being knocked over with much disregard, however the 78-year-old Housewife wearing CHANEL head to toe who was purchasing spiked flats, made my presence worth it at this location, however i did meet her on the way out, we had that in common for sure. Helping her out the door, i expressed to her “You look Fab Doll” and she replied” Your such a sweat heart, can you believe they didn’t have red wine!, It’s better for the heart you know”, I was thrilled to have met her, as for the others, like I said “In all respect” im glad people came out none the less. Fashion really has become a global phenomenon which really only happened in the past 10 years or so. Fran Lebowitz once said, “the entire fashion world could fit in one room”, Fashions Night Out 2011, may have changed all that. The Birth of Reality TV, and social Networks, much like Fashion has been for centuries, changed the way we communicate, and it’s overwhelming what the world has to say, and for one night, fashion said, Welcome All, all who make up this world of fashion, and all who appreciate fashion, The Night was truly a Celebration of just that,”Fashion”. lets see what Next Year has in store, and only hope that maybe people will shop FNO 2012! 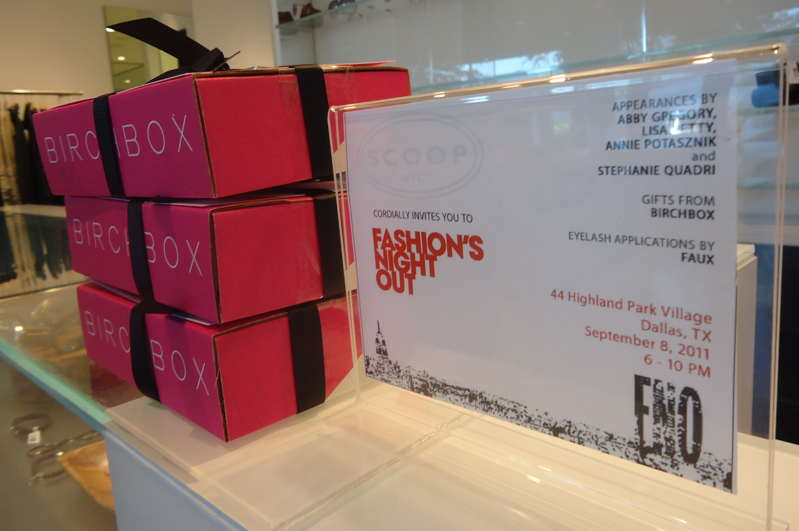 This entry was posted in | and tagged DFW, DVF, fashion, FNO, Jimmy choo. Bookmark the permalink.